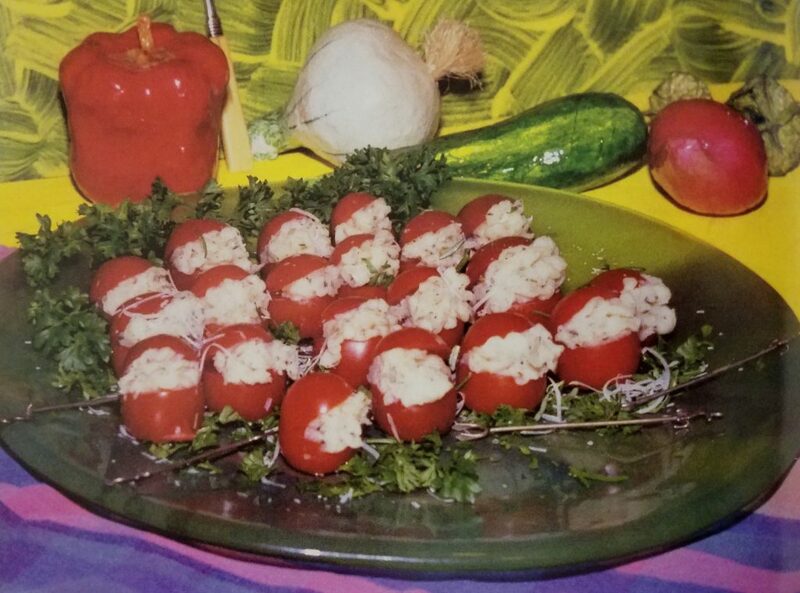 This is a cheerful and tasty dish for a holiday party. You can always substitute mashed cauliflower for the potato if you want to lower the glycemic load. Peel and cube potato. Boil until very soft. Mash or whip in a food processor. Meanwhile, heat a skillet over medium heat and add oil. Add onion and salt. Sauté 3-4 minutes until onion turns yellow. Add herbs and heat 1 minute. Set aside. Slice a sliver off the bottom of each cherry tomato to form a flat base. Slice off the top third of the tomato. Set base and top aside. Repeat this process with each tomato. Combine potato, sautéed onion, and grated cheese. Spoon or pipe 1/2 teaspoon filling over each tomato base and cover with top hat. Garnish with herbs. Arrange on a serving plate. Garnish plate with remaining chives and a few sprigs of parsley.